Twice postponed it was 3rd time lucky for the last remaining Norfolk Women’s County Cup quarter final to be played, Norfolk Division One side Sprowston Athletic Ladies taking on King’s Lynn Town Ladies for the league above ERWFL Division One. An away tie in the semi-finalists against 2 times County Cup winners Thorpe United Ladies the prize and beyond that a trip to the home of Norwich City FC, Carrow Road for the final itself. King’s Lynn started slow both sides having not played since the 13th of January, the visitors going on to take the lead eventually running out 4-0 victors to reach the last four of the competition with goals from Tiffany Forshaw, Rochelle Woods, Emma Corbyn and Becky Russell returning to the side just 8 weeks after giving birth to son Charlie. Both semi-finals to be played on Sun 17th February, King’s Lynn have a busy run coming up having fallen behind in their league fixtures. The other semi-final a repeat of last season’s final with Acle United Women hosting Wymondham Town Ladies. 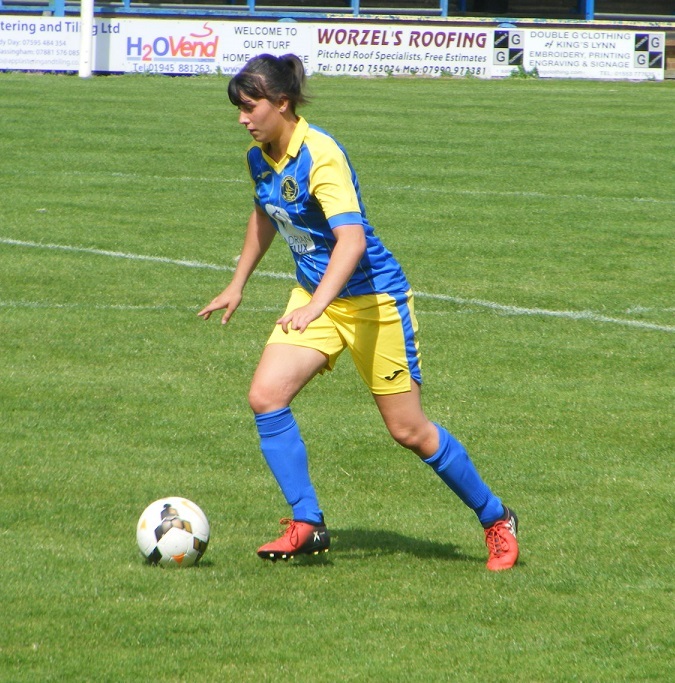 Just one defeat from 11 played Thorpe United Ladies recorded their 10th win of the season on Sunday to open up a commanding 15 point lead at the top of Norfolk Women’s Division One this Sunday, were away to the side that inflicted their only defeat Wymondham Town Ladies Reserves. Captain Rebekah Lake finding the back of the net for 3 goals her hat-trick seeing Thorpe win the game 3-1 with Kayleigh Holloway scoring for the hosts. It was 2nd versus 3rd in the other match played in Norfolk Women’s Division One on Sunday with Aylsham Ladies hosting Sprowston Ladies. The two sides meeting at the start of the year in the league cup Sprowston running away with the win 8-1. This Sunday in the league a hat-trick from Victoria Leyer saw Sprowston take a 3-1 lead into the half-time break. Plenty of goals scored in the 2nd half a 7 goal thriller, Aylsham hitting back to score 3 goals in the 2nd half, Sprowston edging t with 4 goals to win the game 7-4! Leyer on target with all of their goals adding 7 to her goal scoring tally moving her onto 19 for the season, those goals helping to take Sprowston into 2nd above Aylsham on goal difference. The weather playing it’s part in Norfolk as it did across the country on Sunday saw just one game played in Norfolk Women’s Division Two, but it was a big result for Bulldogs Ladies as they won their first ever game in woman’s football the Thetford based side at home to Freethorpe Ladies. Drawing 1-1 at half-time Bulldogs nicking the 3 points in the 2nd half winning 2-1. Melissa Collis and Emma Johnson with the all important goals. Laura-Jayne Peachment with the first half goal for Freethorpe. This entry was posted in Norfolk Women's County Cup, Norfolk Women's Division One, Norfolk Women's Division Two, The Round-Up and tagged Norfolk Women's County Cup, Norfolk Women's Division One, Norfolk Women's Division Two, The Round-Up on February 6, 2019 by WFEast.